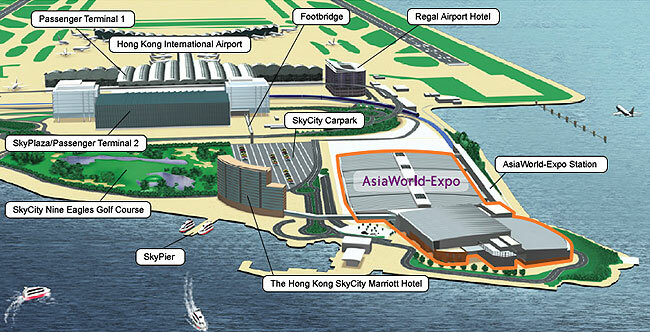 Hong Kong's newest and largest exhibition venue, AsiaWorld-Expo (AWE), adjoining Hong Kong International Airport, is easily accessible by all means of transport. Please click here for more information on new and enhanced transportation links to AsiaWorld-Expo. 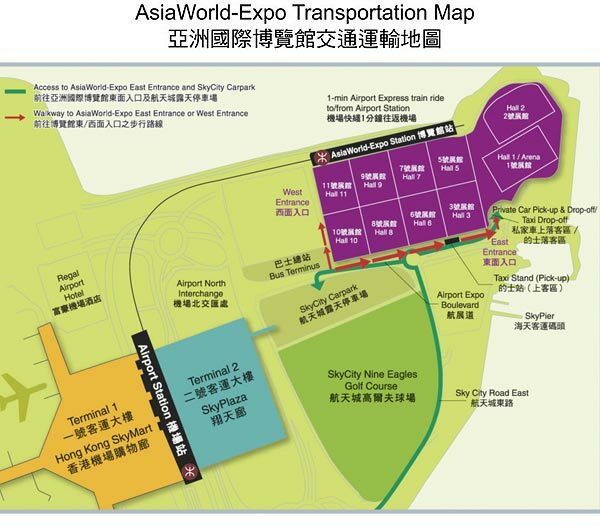 Passengers arriving by air can take the 1-min Airport Express ride from Airport Station to AsiaWorld-Expo Station. Passengers arriving at level 5 (Arrival Hall), leaving the immigration and baggage claim areas walk straight ahead through the Greeting Hall and go up to level 6 (Departure Level) to board the Airport Express train to AWE. It takes around 1 minute from Airport Station to AWE Station. For detailed information about Airport Express' service, timetable, tickets and fares, please visit MTR Corporation's website. Enjoy our free shuttle bus service to and from Eco Expo, Asia - International Trade Fair on Environmental Protection. AsiaWorld-Expo Station on the Airport Express Line provides convenient access to all train services on the MTR network. For detailed information about Airport Express/MTR's service, timetable, tickets and fares, please visit MTR Corportation's website. Various buses run between AWE and Hong Kong Island, Kowloon and New Territories. For detailed information about bus service, timetable, ticket and fares, please visit Citybus Limited's website or Long Win Bus Co Ltd 's website . Regular daily cross border bus services provide easy land access to and from AWE, Hong Kong International Airport and the Mainland China. For detailed information about bus service, timetable, ticket and fares, please visit China Travel Tours Transportation Services Hong Kong Limited or Eternal East Cross-Border Coach Management Company Limited's website. Taxi Stand - When leaving AsiaWorld-Expo, visitors can take taxis at the Taxi Stan located near the East Entrance. Ample parking space is available at the SkyCity Carpark (near to the West Entrance of AsiaWorld-Expo) for private cars and motor cycles. Parking rate is offered at HK$18 per parking hour or HK$90 for prepaid day-park (for period from 8:00am to 8:00pm) or 24-hour parking is $144.